One of the big TV series that my sons enjoy watching is Chuggington. They enjoy the series so much that they are always eager to find out what new adventures Wilson, Brewster, and Koko are up to. If your juniors share the same excitement over the series, they may like this brand new app from Story Toys: Chug Patrol: Ready to Rescue. The story starts with the introduction of Jackman, the chief of Chug Patrol. He then invites you to become a member of his team. Throughout the book, you will hear him guiding you to help other Chuggers who are in trouble. In total, there are nine Chug Patrol challenges. Each challenge comes with its own 3D page layout, animation, interaction and special instructions. For example, in the first challenge, you need to move logs that are blocking the track. Another challenge may ask you to turn Brewster's lights on, and guide Wilson to pull Koko out of a collapsing mine tunnel. Similar to Badge Quest series, each time you complete a challenge, you will get a Chug Patrol badge. 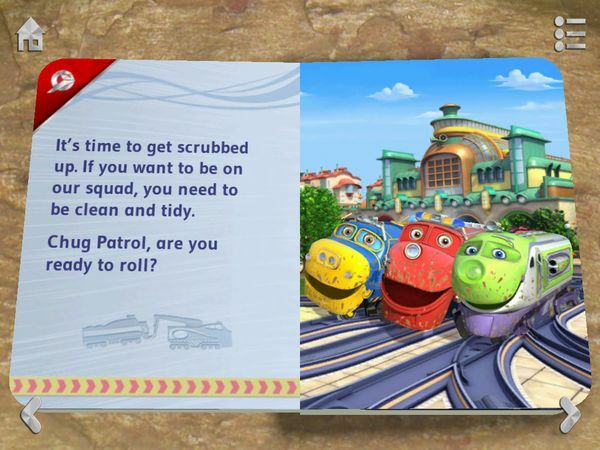 To a Chuggington fan, this storyline introduces you to the new Chuggers in Season 4. These include Jackman the Chief of Chug Patrol, Hanzo the fastest Chugger in Chuggington, and the Chuggineers Zack, Fletch and Tyne. Because Wilson is now a new Chug Patrol trainee, you will also see him hooked up to a Claw Car (Chug Patrol One) or a Stretch Car (Chug Patrol Four). I was a bit surprised to find out that this story app was developed by Story Toys. It was a nice surprise though, because I like the way Story Toys transformed many fairy tales into 3D popup books formatted for the iPad. If you're also familiar with Story Toys apps, you will expect the best quality graphics, narration, sound effects and interactions. This app delivers all of those in 21 beautiful pages and nine interactive mini games. The only thing that I miss is the 3D sticker book and jigsaw puzzles that are included in the latest updates to all Story Toys apps. I'm looking forward to have this feature be included in a future update. Chug Patrol: Ready to Rescue has two mini games that require you to time your taps. The first one is a game where you help Wilson to catch runaway wagons with the Claw Car. In this game, you need to time your taps and catch the red car before it passes off the screen. It gets tricky when the red car moves very fast across the screen. The second game involves you clearing the way for a derailed Emery. Because Emery's brakes doesn't work, you need to move fast and clear the way before she hits the logs. I also like the other mini game where the Chuggineers show Brewster how to lay new tracks. It's a multi-step activity, starting with Fletch digging the soil and Brewster making the ground flat. Then, Tyne will lay the track before Zack welds it together. You will see the Chuggers use different specialized cars to work together making the new track possible. Chug Patrol: Ready to Rescue is an excellent storybook app from Story Toys. If you're a Chuggington fan, you're going to enjoy this app. The app highlights Wilson's new adventure as a new Chug Patrol trainee, facing many challenges and collecting badges as he completes them. As a Chuggington and Story Toys fan, I hope they continue this collaboration to produce more Chuggington-themed storybook apps in the future. Get Chug Patrol: Ready to Rescue on the App Store.